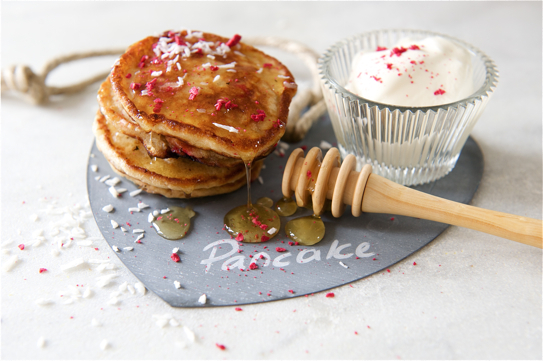 Happy Pancake day – here is one of our favourite recipes from the British Larder…..
Where is the year going!?! Well it’s nearly Shrove Tuesday, which is the last day before Lent and known to everyone as Pancake Day. We love a good pancake, there are so many different shapes and techniques but everyone has their own special recipe to enjoy this indulgent and delicious snack. Today I made fluffy, spongy, sweet and superbly yummy pancakes. I have chosen to make mine fairly small, 6cm in diameter to be precise, well it allows me to be indulgent and they do look rather pretty on a plate. I have served these for breakfast with a large dollop of crème fraîche, a swizzle of local honey and a big squeeze of lime juice. Actually to be completely honest I did not buy any of the ingredients to make this delicious breakfast, it was more a make it up as you go along idea. In my terms whatever I have in the larder. I found one lime, plenty of fresh free range eggs, dessicated coconut that I bought a while ago to make lamingtons, which never got made and then the berries from the freezer. I love my freezer, or shall I say freezers. We have nothing of great value stored in them. Mainly frozen seasonal berries and fruits, ginger, lemongrass, chillies, home made curry pastes, chicken stock and even more berries! Mr.P’s dad Roy has the most fantastic redcurrant bush that produces more berries than the three households in the family could possibly eat in one season; hence I store them so that we can enjoy them the year round. The same goes for the raspberries, we had a fantastic harvest last summer and finally the last few went into this recipe. The combination of raspberries and redcurrants is one of my favourites, bizarrely they work incredibly well together. I suppose the raspberries counteract the sharpness of the redcurrants and visa versa, I make a stonklingly good Raspberry and Redcurrant Jam that I class as my signature jam. I hope this recipe will encourage and inspire you to make up your own Shrove Tuesday delight, go on rummage through your larder it’s amazing what one can find. You could make savoury or sweet pancakes or why not go the whole hog and make both! 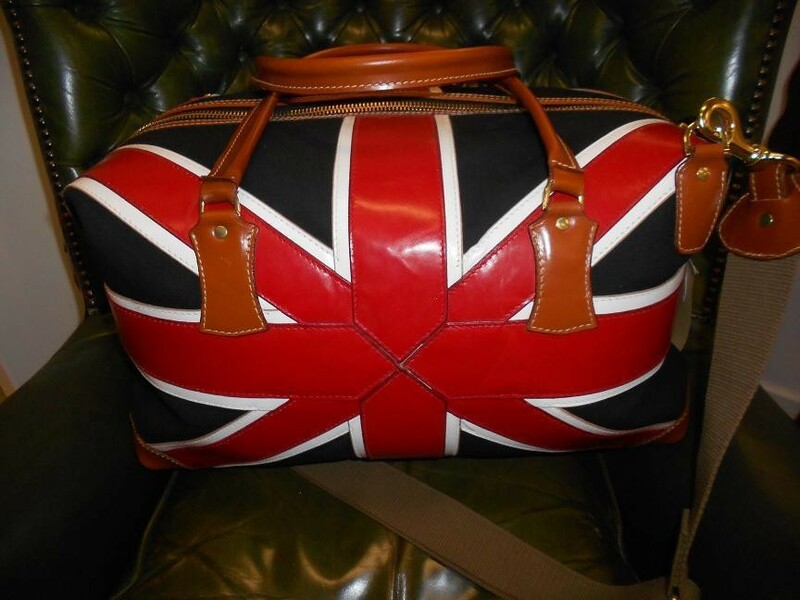 Happy flipping,but make sure they do not stick to the ceiling! 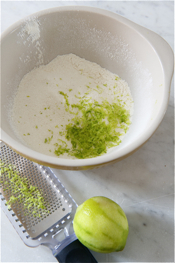 Sift the flour, baking powder and salt into a bowl, add the lime zest and set aside. 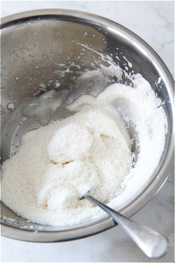 Whip the egg whites till they become foamy and aerated, add the honey and continue whipping until the meringue forms soft peaks, fold the dessicated coconut into the meringue. Whisk the egg yolks, milk and melted butter together and fold the wet ingredients into the flour to form a batter, if the flour makes lumps do not worry as these will dissolve however do not over mix the batter as this will make the pancakes tough. 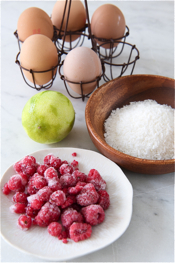 Fold the coconut meringue and frozen berries into the batter, use a large spoon and do not overwork the batter. Heat some butter in a large non-stick frying pan and once the butter starts to foam, spoon tablespoons of the batter into the pan to make approximately 6cm diameter pancakes. Once the pancakes turn golden brown flip them over and continue cooking them on the reverse side until golden brown. Drain the pancakes on kitchen paper. Serve warm with a large dollop of crème fraîche, a swizzle of honey and a generous squeeze of lime juice. I have used frozen fruits from my freezer which were left from my summer harvest. You can use any berries of your choice however I recommend that you use them from frozen, do not defrost the berries as they become shapeless and looses all their juiciness.